Have you got Mothers’ Day in your diary yet? It’s approaching fast – this year Sunday 18 March is the day when you’ll need to shower your mum with cards, flowers, lunch and all the rest. Ok, ok, so Mothers’ Day is different for everyone. Some people like to mark it with a trip to the local pub for a nice lunch, flower sellers do brisk business, and many people simply drop a card in the post. 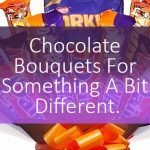 It’s the thought that counts, of course – but we think one of the best ways to show you’ve really thought about your mum is to choose a present you’ll know they’ll love. 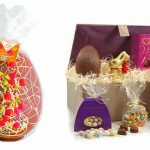 And we might be a little biased, but a hamper packed with special treats seems like a great option to us! 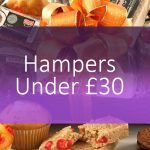 It certainly makes a change from flowers, although there’s no guarantee a hamper will last any longer if you choose well. 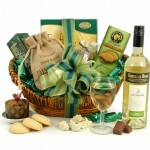 We have a range of Mothers’ Day gifts on our main website. With prices from under £30, they’re an affordable way to send your mum a slice of luxury. 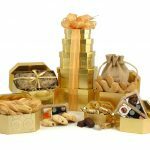 You’re not limited to hampers either – you’ll find gift boxes, impressive towers and even a stylish bowl filled with pampering gifts. 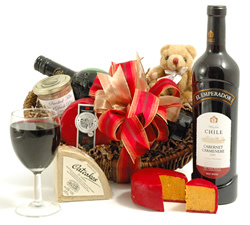 For a wine-loving mum, try our Wine, Cheese and Pate Hamper. The combination of award-winning Red Leicester cheese, and respected Argentinean red wine will go down a treat on that Sunday afternoon. For something soft and cuddly, it has to be the Champagne Gift Box. 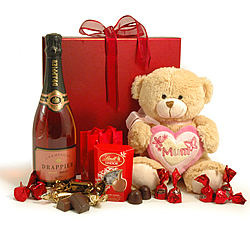 Not only will your mum get a bottle of rose Champagne, but she’ll also be spoilt rotten with a choice of chocolates and a soft teddy bear. For the ultimate pampering, you’ll be needing the Luxury Organic Pamper Hamper. 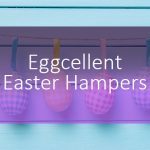 Not only does the name rhyme, but this hamper contains a luscious selection of AmaZene bath and body products. 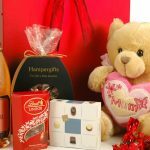 How will you be celebrating Mothers’ Day in 2012? Leave a comment to let us know.